Article by Alison Hugill, Photos by Anna Russ // Friday, Feb. 12, 2016. 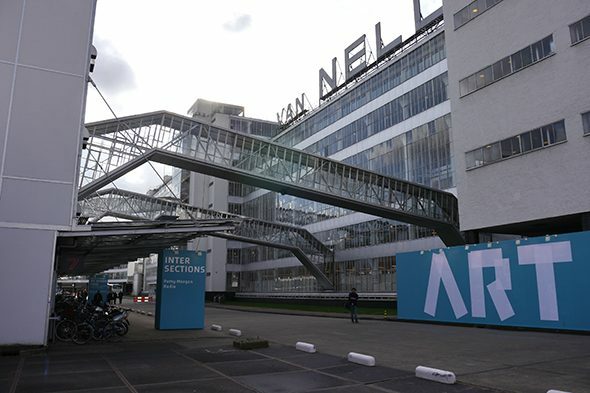 Art Rotterdam‘s 17th edition opened this week in the iconic Van Nellefabriek, a modernist factory built between 1925 and 1931 to function as a coffee, tea and tobacco manufacturing plant. Today the building houses a mixture of design and architecture studios as well as a spacious event hall perfect for art fairs. 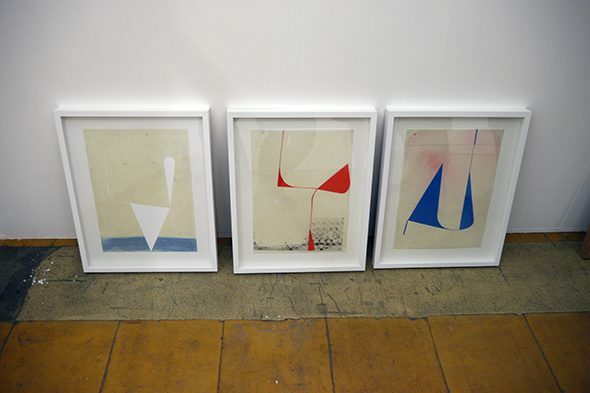 A striking impression from this year’s fair, whether intentional or not, was the proliferation of artists and artworks presenting aesthetic nods to the modernist architecture in which they were exhibited. The first opening at the fair preview was the Intersections exhibition, showing a series of mostly Dutch installations and performances. 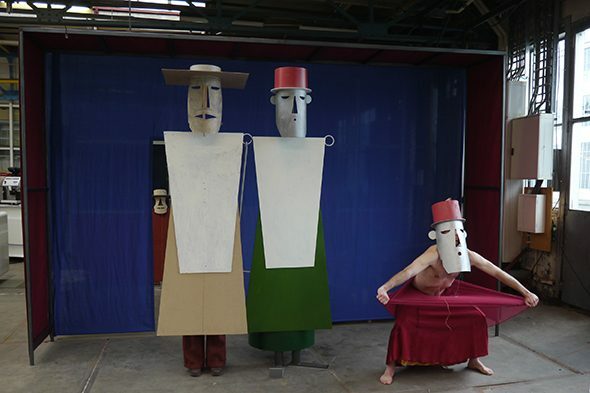 Among these, Dirk Zoete‘s ‘be-part exercises’ made use of Bauhaus-style costumes in a pseudo-dance performance comparable to Oskar Schlemmer‘s simplified gestural movements. Other installations, like Tim Hollander‘s ‘Institutional Soup’ – a play on the standard information booth of pamphlets offering little information – were more conceptually-driven, but indicative of a certain graphic design trend popular in the Dutch art scene. 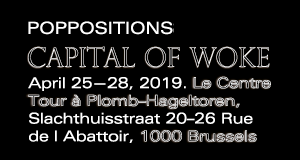 Visible in the Rotterdam Contemporary‘s classically minimal and jauntily askew font and the work of many graduates of the Rietveld Academy‘s design department, a certain graphic style prevailed throughout the city’s art institutions. 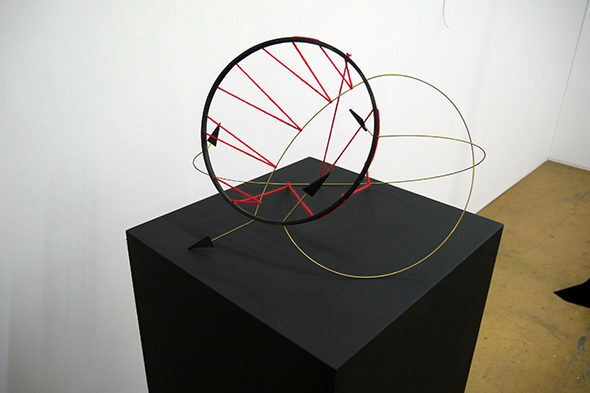 In the neighbouring warehouse space, a small and intimate stage box was mounted, painted in the exceptionally prevalent Bauhaus primaries and surrounded by an independently twirling yellow ribbon. 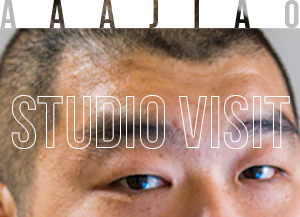 Intersections and Prospects & Concepts proved a refreshing addition to the typical fair booth set-up, with more experimental video and interactive installations. 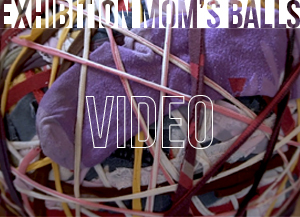 Coming Home, a film by Fabia Mendoza, linked the exhibition to the unusual piece outside of the fair entrance. 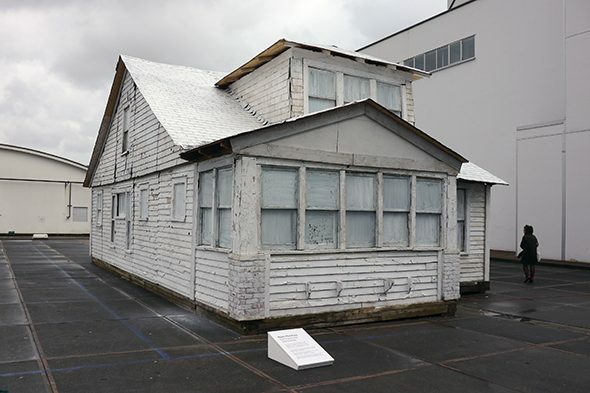 Ryan Mendoza‘s ‘Detroit House’ was just that: a rundown house from Detroit, saved from imminent demolition and transported to Rotterdam, to be rebuilt and displayed. The embedded politics of the house may be fraught with class and race tensions but the white paint and white cubes of the fair had an eerily neutralizing and depoliticizing effect. Inside the main section of Art Rotterdam, almost every second gallery booth was showing some kind of neo-modernist painting, sculpture or textile work. 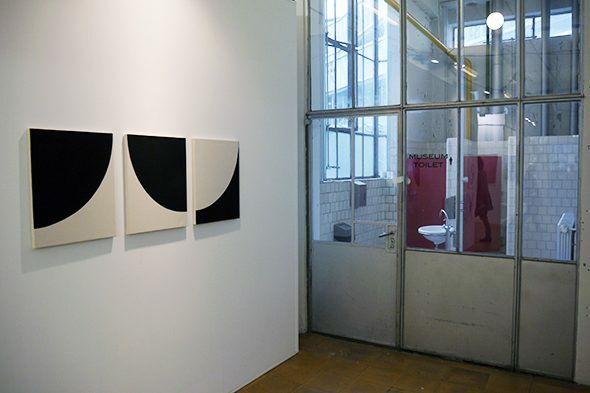 Geometrical patterns and block colours dominated the artistic style, from German artist Katrin Bremermann at Galerie Martin Kudlek (Köln) and Elvire Bonduelle at the Galerie van Gelder (Amsterdam) booth to the complementary wood and collage works of Louis Reith for Mini Galerie (Amsterdam). 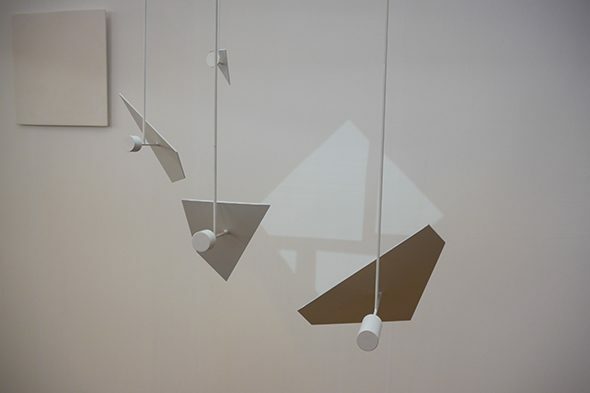 A series of mid-sized mobiles at Krobath (Jenni Tischer) and Sofie Van de Velde (Germaine Kruip) galleries set the tone for the sort of sculptural works shown at the fair, the kind of products suitable for small-scale collectors to house in their homes. Again, the geometry and subtle mechanics of the pieces blended with the elegant interior of the modernist Van Nelle factory, giving an almost curated atmosphere to the fair. Besides in the Projections section, very few of the represented artists used digital media in their works. 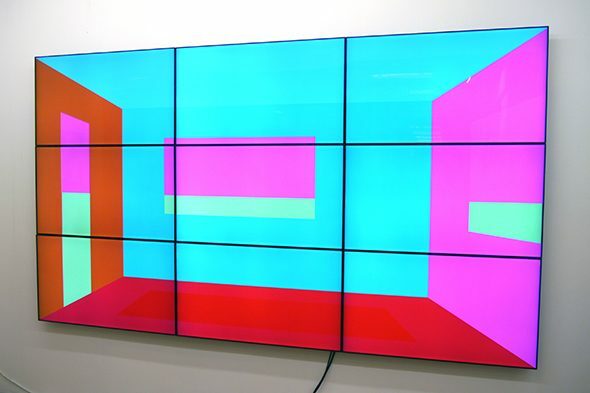 One interesting cross-over, however, was ‘This empty room’, a piece by New York-based artist Rafael Rozendaal, whose digitally-inspired tapestries and computer-generated, colourful interiors stood out amongst the other minimal works. 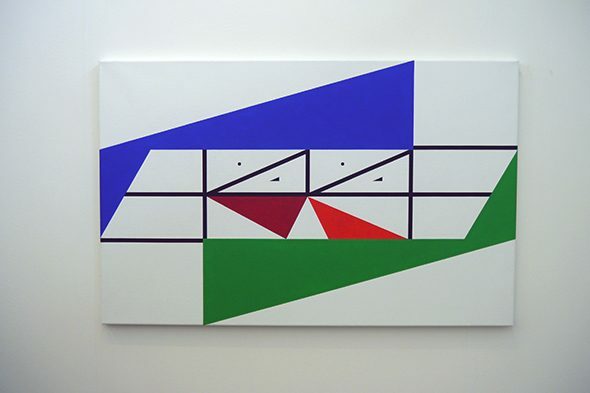 Rozendaal represents a netart generation underrepresented at Art Rotterdam, even in their New Art section, which remained, despite its title, quite traditional. 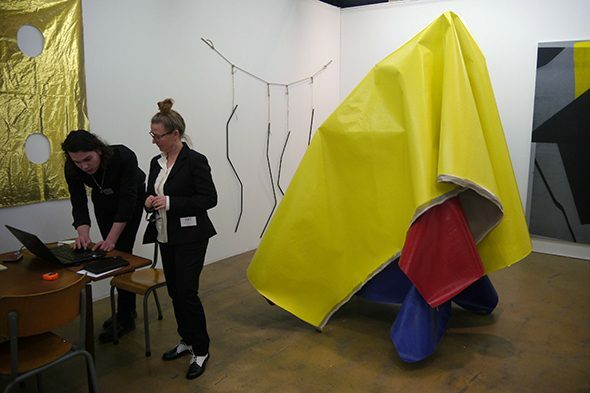 Several satellite exhibitions took place alongside the main event that filled in the gaps left wanting from the fair format. 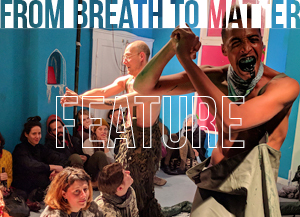 A group show at TENT, Spending Quality Time with My Quantified Self showed some of the best emerging artists of a certain genre, mostly women, whose practice reflects critically on body performance goals and health enhancement technologies. Anna Zett‘s shower sound installation ‘Text-to-Speech’ criticized the universal adoption of standardized English, white-washing dialects and intonations, in text-to-speech software. Zett’s piece merges conceptually with the ‘Attention Spa’ installation of Anni Puolakka and Jenna Sutela, visually evoking cleansing and purity rituals while reflecting on aberrancy in language. As is often the case, the peripheral exhibitions forming part of Art Rotterdam surpassed the limited commercial confinement of the fair itself. 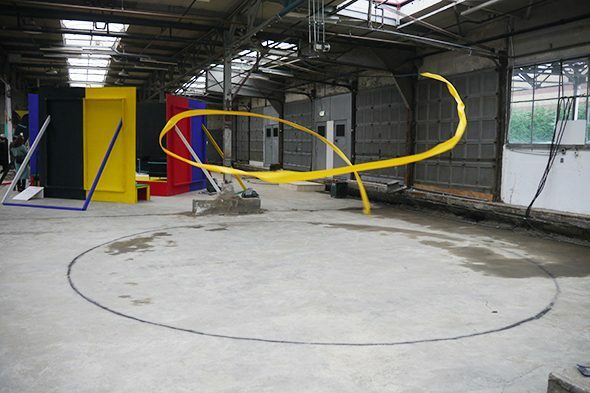 A testament to the fair’s organization, regular shuttles transport visitors between locations to ensure that a variety of art can be accessed, beginning with a slow tour through the industrial area surrounding the Van Nellefabriek and ending up in the heart of Rotterdam’s architectural pastiche.